I love underwater areas in videogames. I don't like drowning in them, which inevitably happens from time to time, but exploring the ultimate "off the beaten path" areas is legitimately exciting, not least because game designers often hide good stuff there. An accidental fall into the drink by Redditor FiveStarFacial, and the Imgur album that resulted, suggests that Fallout 4 is a case in point. The undersea journey only led to the discovery of one lootable item, a simple pot, but he also stumbled across some great flora, and a structure that looks a bit like a pumphouse. He couldn't get inside, but it did have a working light attached to it that attracted his attention. The obvious question is, why is it there? Why is all this stuff there, unless it bears some sort of in-game significance? And let us not forget the secret Fallout 4 harpoon gun that was discovered last week. Why have a weapon designed specifically for use underwater if you're not going to... go underwater? In a later trip, for which he was better prepared, he discovered more structures, including a huge pipeline, some of which he could enter. Could there be more? There could be! 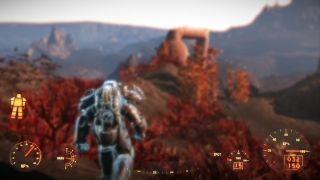 Even if there isn't, there's some quality sightseeing down there, and whether you want to uncover secrets or just wander around, it's easy to do: The power armor has its own air supply, but it's slow and cumbersome; Mirelurk cakes (mmm, mirelurk) will give you the ability to breathe underwater temporarily, and if you're a serious swimmer, there's also an Aquaboy perk that will give you the ability permanently.